Leasing Available from $28.07 per month! 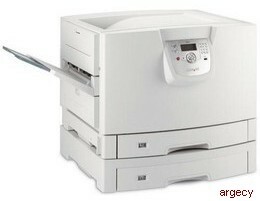 Looking for Lexmark C920 Parts? Leasing Available from $27.84 per month! Versatile: Wide-format (A3, ledger) with high capacity input and finishing options for high volume production jobs. Extensive media range including wide-format and 11.7 in. x 48 in. (297 x 1219mm) banner sizes for specialty applications. Fast: Up to 36 ppm in black and 32 ppm in color with a time to first print as fast as 9.5 seconds in black and 13.5 seconds in color via a 1,000 MHZ processor with 256 MB RAM standard, expandable to 1GB. Production paper handling with a maximum input of 5300 sheets and output of 1650 sheets. Stapling, hole punching, and job offset allows users to professionally finish documents close to their workstation. 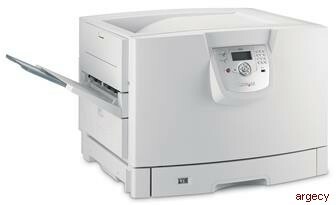 200,000 page one time maximum monthly duty cycle allows large workgroup support and production printing capability in one device. Wide format capability extends the company's in house printing capability enabling quicker turn around of critical print jobs. 2400 Image Quality provides excellent color images and business graphics. SWOP simulated and EuroScale simulated color tables with Pantone Calibration provide accurate color for pre-press layouts and finished brochures. 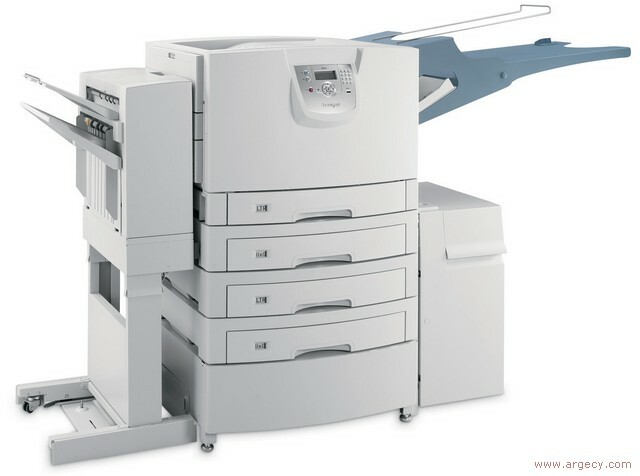 Up to 36 ppm in black and 32 ppm in color (up to 19 ppm when printing duplex) to quickly handle short or long run jobs to maximize productivity. 1000 MHz processor with 256MB of standard RAM (maximum of 1GB) quickly drive a quick time to first page as fast as 9.5 seconds in black and 13.5 seconds in color. In network printers with Lexmark MarkNet N8000 series print servers, Simple Network Management Protocol (SNMP) v3, Secure Sockets Layer (SSL*), IP Security (IPSec) and 802.1x authentication provide security measures for printer communications and data encryption. For any printer, hard disk data encryption for print job data security and printing restriction. Confidential printing with enhanced personal ID number (up to 10 digits) management including lockout, job expiration, and invalid PIN protection. *This product includes software developed by the OpenSSL. Size (" - H x W x D) 20.2 x 27.4 x 28 "
Packaged Size (" - H x W x D) 27.2 x 32.9 x 29.9 "
Packaged Weight (lbs) 194.2 lbs. Pallet Size (" - H x W x D) 31.2 x 32.9 x 29.9 "